This page provides links to a variety of sources of reliable, verifiable information dealing with cover-ups related to war and the military/industrial complex. Our most basic material is listed first, followed by other resources which delve deeper for those interested in more. We recommend reading through this entire page before exploring the links provided. 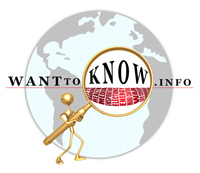 WantToKnow.info presents this war information as an opportunity for you to educate yourself and others, and to inspire us to work together to strengthen democracy and build a brighter future. The Power of Nightmares is a revealing BBC documentary that digs deep into the roots of the war on terror, only to find that much of the widespread fear in the post 9/11 world has been fabricated by those in power for their own interests. The intrepid BBC team presents highly informative interviews with top officials and experts in combating terrorism who raise serious questions about who is behind all of the fear-mongering. This eye-opening documentary shows that, especially after 9/11, fear has been used to manipulate the public into giving up civil liberties and turning over ever more power to elite groups with their own hidden agendas. The Power of Nightmares clearly demonstrates that the nightmare vision of a powerful, united terrorist organization waiting to strike our societies is largely an illusion. For all citizens who care about the future of our world, this is a must-watch video. One day before the 9/11 attacks, US Secretary of Defense Donald Rumsfeld made the astonishing admission, "According to some estimates we cannot track $2.3 trillion in transactions." This astonishing fact is reported on the CBS website (below article provides link). As pointed out by CBS, "$2.3 trillion – that's $8,000 for every man, woman and child in America." In other key reports, we learn that this figure came from a report of the Pentagon's inspector general. "Its own auditors admit the military cannot account for 25 percent of what it spends," reports CBS News Correspondent Vince Gonzales. Why is this startling news not given top headlines in all major media? Why to this day is the press hardly mentioning this most vital issue? A Second War Information Document: An ABC article at the link below describes how America's top military leaders drafted plans to kill innocent people and commit acts of terrorism in US cities to trick the public into supporting a war against Cuba in the early 1960s. Approved in writing by the Pentagon Joint Chiefs, Operation Northwoods even proposed blowing up a US ship and hijacking planes as a false pretext for war. Also at this link are directions for accessing these astonishing declassified documents on the website of the US National Archives and Records Administration. These released documents clearly demonstrate that our military leaders feel justified for reasons of "national security" not only in lying to the public, but even in sacrificing the lives of our own citizens in order to promote their war agenda. A Third Highly Revealing Article on the War Machine. The below article shows how the New York Times and other media consciously hid the devastating effects of the first atomic bomb in order to promote weapons of mass destruction. We have collected many news articles from highly respected media sources which contain eye-opening information exposing various aspects of the war cover-up. Links are always provided to the original sources for verification. The first link below contains one-paragraph excerpts from incredibly revealing news articles with the most important articles listed first. The second link provides the same article excerpts listed by order of date posted to WantToKnow.info, while the third lists them by the article date. The fourth link below contains a list of only headlines and links to some of the most important articles on war. Below these four links, headlines and links to the entire text of several of the very best articles are also provided. A powerfully revealing online lesson brings together the best videos, quotes, essays, and much more on the important topic of war. Developed by individuals involved with WantToKnow.info, this dynamic two-hour lesson provides a greater context with which to understand not only the cover-ups and manipulations going on in the war industry, but how this directly affects our lives and world. This eye-opening lesson also gives ideas on what you can do to make a difference, and leaves you feeling a refreshing sense of hope for the future of our world. We have no doubt that by working together we can and will build a brighter future. When we step out of fear, secrecy, and polarization, we choose to join with the ever increasing numbers of people dedicated to working together for the good of all in our world. You can make a difference right now by sharing this war information with your family, friends, and colleagues. Click on the "share" link at the top or bottom of this or any page on this website to help spread this valuable information far and wide. To contact your political representatives and the media, click here. All pages, especially our summaries, are also designed to print well so that you can copy and share the information given. Thanks for caring!